Mangosteen is a rare and exotic fruit that, despite its scarcity, has grown a cult following in the US. Since about 2010, people have been flocking to this unique fruit spending $2B on a juice that boasts not only a sweet, delicate flavor, but a bounty of health benefits. But what exactly is a mangosteen? Mangosteen, as it turns out, is a small fruit with a hard shell on the outside and a white flesh on the inside in the shape of a flower. The flesh is naturally sweet and juicy and is enjoyed by people of all ages across the world. In order to cultivate this special fruit, mangosteen trees require 3 types of nutrients that only come from close proximity to the sea, heavy rain, and exposure to strong sunlight. As a result, 90% of the world’s supply of mangosteen comes from South East Asia. Mangosteen trees can take up to 15 years before they bear fruit and sometimes only bear fruit every other year. Mangosteen fruit is packed with Xanthones, nature’s most powerful antioxidant. These rare antioxidants are only found in a few different fruits, and mangosteen contains the highest amount of them. Locals use the fruit in a number of different ways and believe it improves overall skin condition and even helps prevent or cure eczema. The fruit juice is a naturally hydrating way to enjoy powerful benefits to almost every part of the body. Bali’s founder, Edward Farley, spent over 3 years working with local farmers in South East Asia so he could supply people with the best quality mangosteen juice in the world. After years of tireless work and cultivating local connections, he launched Bali in March, 2018. Bali comes in 3 distinct tastes, each boasting a unique and slightly tropical experience. Bali Glow contains only one ingredient: 100% pure mangosteen juice. 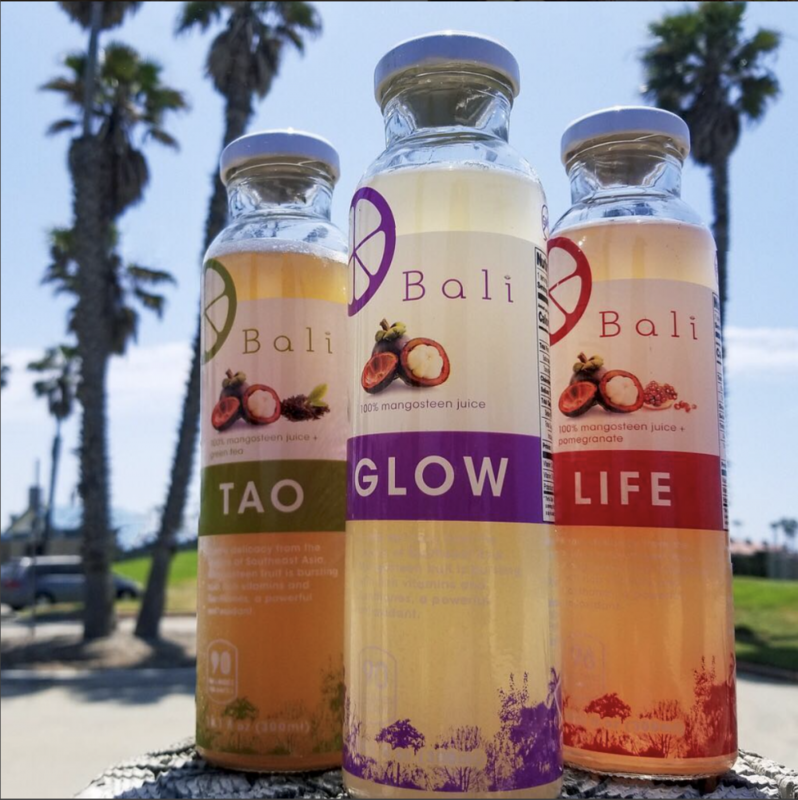 Bali Life contains only two ingredients: pure mangosteen juice and pure pomegranate juice for a sweeter, bolder experience. Bali Tao contains two ingredients as well: pure mangosteen juice and pure green tea for a delicate but decadent drink. All Bali juices contain no additives or preservatives and are all under 100 calories per bottle. Bali is based in California and can be found in all Albertsons, Vons, and Pavilions stores.